SemLab’s semantic text processing platform enables the real-time monitoring of product and brand associated sentiments. In our showcase application AutoSentiment we continuously monitor the top ten most popular online automotive blog websites in The Netherlands and capture the sentiments expressed in the edited articles as well as in the readers’ comments. In contrast to traditional sentiment tools, we determine the semantics of the expressed opinions by comparing the text to an automotive ontology of over 300 events. These events describe the most common concepts expressed in these types of text. For example the events range from “I like the car” to “the engine noise is barely audible”. Furthermore, the events are classified in the seven main quality parameters for luxury cars: Price, Looks, Driving experience, Comfort, Fuel consumption, Quality and Safety. A live version of the AutoSentiment monitoring system is available here. The system is currently online and has processed about 145.000 text items resulting in 141.396 useful events. Excluding all car brands that yield 50 events or less, results in data on the 37 most popular car brands currently available in The Netherlands. 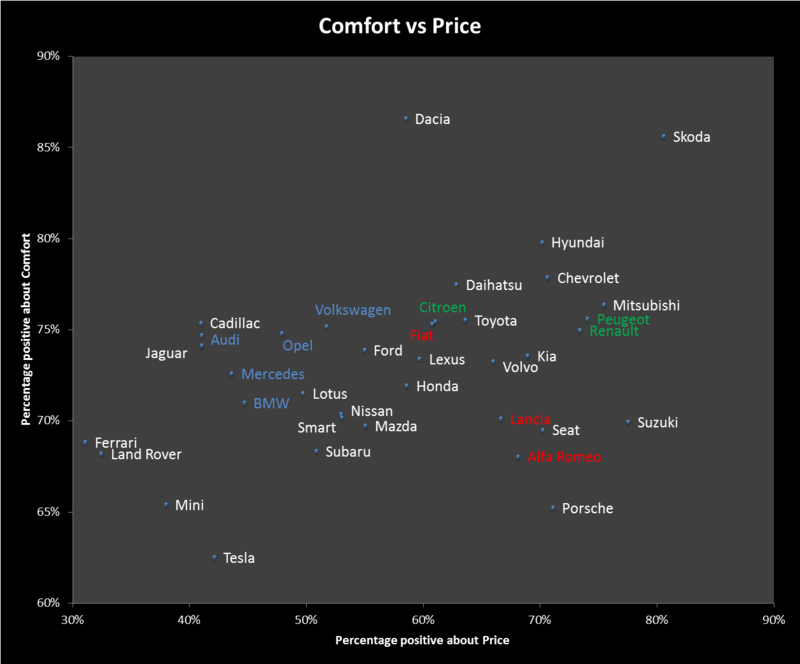 The graph above lists the car brands according to the percentage of positive sentiment about its purchasing cost. 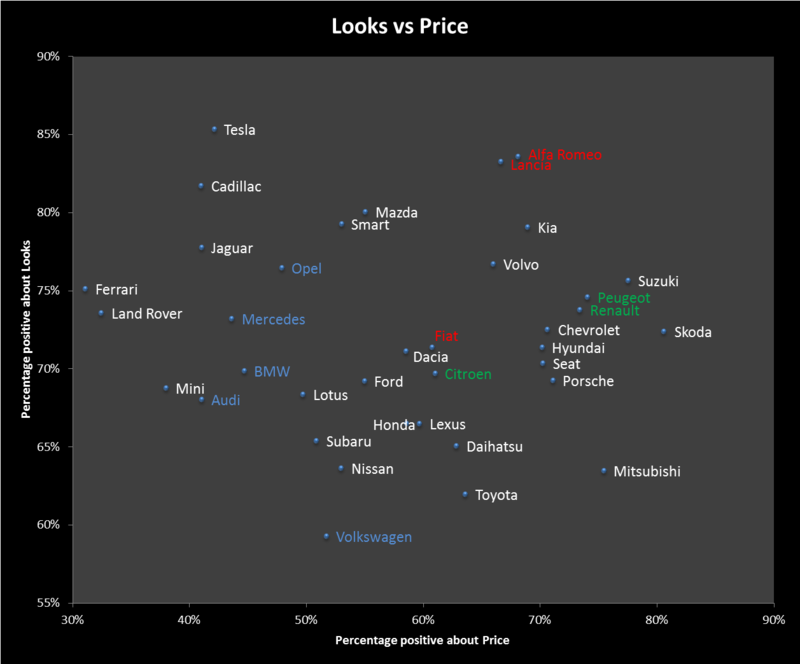 On the left hand side the brands are perceived as (too) expensive, the cars on the right are deemed affordable or to offer good value for money. The overall results are not surprising: The top five expensive car brands include Ferrari, Land Rover and Cadillac, whereas the affordable brands are Skoda, Suzuki and Mitsubishi. More interesting is the position of Dacia and Renault. Renault is perceived as significantly more affordable than its low cost sister brand Dacia, which this data puts in the same range as the acclaimed luxury brand Lexus. Regarding the driving experience, the top three consists of Porsche, Jaguar and Ferrari. The worst driving experience is expected from Chevrolet (In The Netherlands mostly marketing the former Daewoo models) and Dacia. The aesthetics associated with the car brands result in the graph above. The bottom section is the domain of most of the Japanese brands (with the exception of Suzuki and Mazda) and, more surprisingly Volkswagen. The top section is populated by the Italian design of Alfa Romeo and Lancia, but also Tesla whose limited model range has an almost unanimous appeal. Another way of examining this data is to plot one factor against the other. For instance when using price on the horizontal axis and the looks on the vertical axis results in the graph below. This graph clearly illustrates that for affordable good looking cast the Italian brands are in a league of their own. Fiat seems to be a bit out of contact with the other Italian brands, but still scores higher than most traditionally German brands. The French brands are mostly associated with reasonably affordable and generally comfortable cars. This expectation can also be checked using our data since comfort was one of the main parameters included. The graph below plots the perceived comfort versus the price level of that brand. The graph above illustrates that the Italian brands are perceived to offer less comfortable cars that the traditionally French brands. German brands score similarly but are generally in a higher price range. Surprisingly, Volkswagen scores higher than the luxury brands Mercedes and BMW. This may well result from the definition of Comfort used in this test, which included ergonomics, personal space and general practicality. The conclusion that we draw from these results is that the data appears to be in agreement with most stereotypical preconceptions about the car brands. This is a good thing since the system is aimed at capturing the opinion of the general public, which by its nature can be expected to be sensitive to stereotyping. A logical improvement in this study is to examine the various car models instead of the generic brands. In fact, the required data is available so if anyone is interested in these results or any other aspect of real time product sentiment monitoring, please don’t hesitate to contact us. With Semlab’ proprietary semantic web software you can analyze millions of user forums, tumblr blogs, Twitter, Facebook and Google+ feeds, in order to measure in real-time the sentiment of your product and service opinions. It has been a challenge imposed by processing social media because of use of incorrect language, irony, short or incomplete sentences, lack of contextual information, use of multiple languages and use of slang but Semlab succeeded to address all of these challenges with its semantic web solutions and other language processing technologies. Semlab successfully can offer with the highest precision- and recall, of what the people think about your product and service.Don’t matter what language, slang they are using, you will capture the sentiment of the crowd immediately .User Case: Financial ServiceIn the domain of retail financial services, e.g. stock market investments, insurances, mortgages and consumer saving- & lending money, product- and service offering opinions will be processed real time.The combination of machine translation and automatic sentiment analysis has proven to be effective as semantic sentiment analysis appear to be relatively insensitive to grammatical translation errors. Especially in verbose and plentiful (highly redundant) social media messages even imperfect translations allow for reliable sentiment extraction. This was demonstrated in a precious project SemLab executed with the world most respected universities in this field where 81% translation accuracy was sufficient to drive adequate sentiment extraction from financial big data in social mediaThe resulting sentiment will be visualised in a GUI suitable for monitoring social media and to enable integration in social media outings. The solution will be accessible through a web based service providing a clear visualization of the sentiment data and database. The reputation brand monitoring and marketing solution is specially suitable for retail banks and insurance companies. These companies valued the content coming from the solution as consumer feed back of the findings of their financial products and how new financial product are received in the market. This solution will address specifically the risk metric of financial service products from the eyes of consumers, the feed-back will allow the financial service companies to adjust the offerings accordingly and consequently improve reputation in the market. A clear example of the current situation is the recent development on the Dutch mortgage market. The Dutch government has declared that the requirements for a mortgage are seriously increased. However to prevent total lock-up of the property market, the public is allowed to take a second loan. This second loan can be used to fulfil mortgage payments. Whereas this leads to opportunities for the mortgage suppliers, the general public is unable to assess the implications this can have for their overall cost. This is currently causing severe unrest in the Dutch mortgage market indicating the severely increased sensitivity of the financial services market for this – relatively transparent – measure. If you want to stay in control of the opinion: use our proprietary semantic web software. SemLab has passed the first stage with their MASS proposal for the FP7 call on Digital Content and Languages, a funding scheme of the European Commission. In this proposal, SemLab and innovative European partner organisations propose to create a functioning multimedia sentiment analysis platform that incorporates automatic semantic analysis of customer feedback from a wide variety of web-based multimedia, and automatic translation of small and large European languages. In order to understand social customers, companies must understand the (often unknown) languages of their customers. Today’s existing social CRM solutions are monolingual and are not suitable for following consumers’ responses across Europe. By incorporating automatic translation for larger and smaller European languages into the system, MASS can step beyond the current state of the art and deliver a database of social media information and a system that can determine sentiment from different language groups, cultures, and countries from these data. This will enable companies to tap into a large base of social customer sentiment, and use this in their CRM solutions. By using the latest semantic analysis technologies, the sentiment portrayed in social media can be extracted. Furthermore, smart semantic tools are used to interpret specific web language, such as shortened words or expressions, emoticons, new ‘internet’ language, etc. SemLab and the other partners of the Let’sMT project have met in Luxembourg to present the results of the first year of the project. Presentations were given for each of the work packages as well as a live demo of the already operational translation system, the translation widget and browser plugin. The preliminary response from the evaluators was very positive and the project will continue as planned. SemLab has been invited to give a pitch at the PICNIC event’s pitch night. Ten selected companies will present their product or service to a panel of experts, who will offer personalized recommendations to each company. For both participants and the audience, this will be an exciting night focused on learning, growth and innovation. SemLab will present their ViewerPro semantic analysis platform. Part of the SOLIM project’s research results have been submitted as a research paper entitled “The use of OWL for Spatial Knowledge based Applications” in the Semantic Web journal. The paper was written by representatives of SemLab, Tilde, Picsearch and AGMLab. In this paper it is demonstrated that the use of OWL and spatial reasoning tools – despite shortcomings – enables effective storage of, and reasoning with spatial information by use of a hybrid solution. The utility of this solution will be illustrated by its application in two diverse domains; automatic processing of textual information and querying of graphical information, in machine translation and image searching applications. The Solim project for spatial reasoning has entered the last phase, in which the technology developed will be implemented into two POC applications for evaluation. The two applications that will utilise the spatial reasoning technology are Picsearch’s Image Searching system and Tilde’s Machine Translation system. Semlab in Machine Translation project: Let’sMT! Semlab had joined an international consortium of researchers, linguistic experts and software developers to create a system that automatically translates relatively small languages. The focus in the project lies with small languages such as Latvian, Lithuanian, Croatian, etc. and one of the main methods that will be used is Statistical Machine Translation (SMT). SMT systems are built by analyzing huge volumes of parallel corpus and learning translation models from these data. This is particularly tricky with smaller languages since the available corpus data is much smaller. The project aims at a.o. developing a widget or browser add-on that translates such small languages and is currently under evaluation at the European union. The Solim project’s spatial reasoning system has been in development for one year and Semlab, Picsearch and AGMlab will meet their partner Tilde at their office in Riga this week to discuss the project’s future. Last year, the project members have determined the application’s requirements and designed the language, reasoner, translation and image search functionality of the proof of concept (PoC) application. In the coming year, these separate elements will be implemented in order to build the final application.